The USBG-232MINI Mini USB RS-232 to Serial Adapter can be utilized through an existing USB Port to work with your legacy serial connections. It’s great for newer technologies with no serial port connections. Extremely compact RS232 Adapter with TxD, RxD, RTS, CTS, DSR, DTR, DCD, RI, GND signals. USB 2.0 Compliant – Backward compatible for legacy serial devices. High-Speed DB-9 pin connection with 128 byte FIFO and LED Status. Designed with a unique system load reduction feature. The USBG-232MINI serial adapter uses a Mini USB RS-232 format to synchronize your Handhelds, Digital Cameras, or other device currently using a serial port and works with your legacy serial connections. Connecting your serial devices to the newer computer equipment using USB bus technology gives you an advantage of adding one or more serial devices when needed. This adapter is hot plug compatible via its USB connector. The USBG-232MINI Mini USB RS-232 Serial Adapter is great for newer technologies with no serial port connections. Adds one RS-232 serial port by connecting to a USB port. Includes 3 foot USB extension cable. Note: As of June 2018 Windows XP is no longer supported. Please contact us if you require Windows XP support. Works great with my W7Pro desktop and laptops connected to a Cybra. I have several of them. Hopefully when I get new machines with W10, the drivers will be easily available but that’s not for a long while and I have no reason to think it’ll be a problem. Works great with my MacBook Pro running OSX 10.10 (Yosemite). Using it with dBx Driverack and old IBM laptop. No compatibility issues. Seems to be OK. Did not work for my application, but that was my fault. 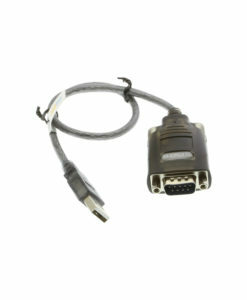 The USB RS-232 Serial Adapter DB-9 Male worked perfect with my female serial cable to the PC computer that only had a USB port. It read my weather station data to the weather program without any problems. The price was reasonable and delivery was reasonable that included tracking. I highly recommend this adapter if you have a female serial cable and need to go to the USB ports of any newer computer that don’t have serial ports anymore. I have purchased an even cheaper RS232 to USB adapter that did not work with Windows 7. This one works well enough that I have purchased two of them. Works perfectly for using old serial equipment over USB. Works great with Windows 7 64-bit. Also works with Windows XP running as a virtual machine inside VMware Player. This device uses a GENUINE FTDI chip, so it is not affected by the newest drivers that disable counterfeit chips. What can I say, it’s a RS-232 to USB adapter, what else is there to say? It’s small, compact, may prevent you from inserting another USB device if the ports are fairly close together, but that’s what a USB extension cable is for. Nothing special, it does what it needs to do, in a compact package. Great for any old serial device you still have. NOT YET, IT DOES’NT DO WHAT I EXPECTEDY YET I WILL HAVE TO PLAY WITH IT SOME MORE WHEN I GET A CHANCE. I bought this because I was having performance issues with another brand of adapter. I had read the reviews on this unit and it was touted as one that was highly compatible and trouble-free. This unit immediately cured all the issues I had been experiencing with my previous one, and I am extremely pleased with this unit. Skip the cheapies and go straight for this one if you want to minimize adapter-related problems. used in some other adapters just doesn’t work with Lion. A half star off for software on mini cd – not cool for Mac laptops. Another half star for the bulky connection. It blocks the other USB ports. I had to get a short USB extneder cable to use my mouse. Otherwise, with the right drivers, it DOES work with Lion. My new HP laptop with Windows 7 does not have an RS-232 compatible port which is necessary for my old Garmin GPSmap 76. This serial adapter plugged right in and fixed my problem right out of the box. I am very happy with it. Quality product with a nice build quality, driver installation went smoothly on my Windows 7 x64 notebook. Will buy from manufacturer again. Plugged it into my system and it has worked like a champ. Before you use the adapter you’ll want to run “Windows Update” off the Start menu. For Windows 7 you won’t need the mini CD-ROM that comes with the adapter. Run “Windows Update” two separate times because there are two things Microsoft wants to install. After those two software updates are installed you’re ready to use the adapter. This unit also came with a very nice shielded USB extension cable too. I’m using it for a very old Garmin GPS device. The Garmin software found the serial port very easily. This serial usb adapter that has the FTDI chipset. The Prolific chipset adapters do not work as well as these. This worked the first time I pluged it in perfectly. If you are having trouble with the prolific chipset adapters, buy this one. I don’t give 5 stars much, but this one is a 5 star item! The price is a little high, but the free shipping makes up for it! The drivers on the CD it came with i’m sure are fine, but they may be 1 rev behind. I got the latest from the main website. I tried 3 or 4 other manufactures of USB to RS-232 adapters and all had issues with the software I was developing. Some USB to RS-232 adapters even blue-screened Windows. This is the only adapter that worked flawlessly. The USBGear device uses the FTDI chipset and has certified Windows drivers. I highly recommend this USB to RS-232 serial adapter. There’s a driver CD but it does NOT include Windows-7.. Turns out the CD is still useful.. upon insertion a web page pops up with local driver links AND a weblink to newer drivers at [..]. Meantime the CD plays a little video explaining how to install the adapter and configure COM port settings. Pretty nice! You don’t need to save the CD since the adapter says ‘USBGEAR’ right on it, so you’ll always know where to get drivers. 5 stars for a nice gadget with good back end support!